Natural Insulation installers Auckland specialise in offering builders, project managers and homeowners a supply and install solution for the residential new build, renovation and commercial sectors. We carry a complete range of quality insulation products from most major manufacturers of glasswool and polyester products for ceilings, walls and underfloors as well as acoustic products. We provide a prompt and fixed price quoting service from your plans or an on site measure. We listen to our customer’s wants & needs and provide a solution that fits your requirements and budget. If your project is anywhere in Auckland (Tuakau to Orewa) contact us today! 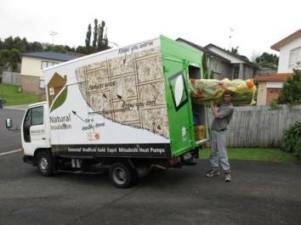 Natural Insulation Auckland specialise in transforming existing houses into warm, comfortable and healthy homes. We also provide clean heating and insulation for new homes. Our consultants take time to assess a home and work out the best way to insulate or heat the home so it is warm in the winter and cool in the summer. Our Auckland insulation installation service is quick and professional and our customers are happy people. Whether you’re in Auckland, on the North Shore or Rodney, our installers can assess your home and install insulation to keep you warmer and dryer. Contact our Auckland office on 0800 111 002 or send an email to greg@naturalinsulation.co.nz.